Wedding dress shopping trip No. 2 happened the weekend after the trek to Portsmouth, New Hampshire. My mom, sister (Martyann), and matron of honor (Liz) were all already venturing up from Connecticut, so I thought it would be good to stay somewhat local and check out a shop in Hingham, Mass., where my friend who got married in July found her gorgeous dress. The dress shop was very cute but disappointing after my trip to Portsmouth. Instead of having dresses brought to me, I was supposed to grab dresses off the rack that I wanted to try on. I wasn't a huge fan of this system after seeing how well it worked the other way. I also ended up trying on dresses that were over my budget (luckily, I didn't like any of them more than the dresses that were in my budget). I would see my mom, Martyann, and Liz get excited over a particular dress, but I kept thinking about the dresses in Portsmouth. After my appointment, I filled them in on how I was feeling about the dresses at this shop compared to the ones in Portsmouth and apologized for not just having everyone go to Portsmouth that day. Rather than let the day be a total waste, we all decided to go out to lunch. We weren't far from the Hingham Shipyard and I had been hearing a lot about Alma Nove, so I suggested we go there. Alma Nove was founded by Executive Chef Paul Wahlberg and co-owners/brothers Mark and Donnie Wahlberg (yes, that Mark and that Donnie), as well as family friend Ed St. Croix. It was named after the Wahlbergs' mother Alma, who had nine (nove) children. The restaurant is right on the water and has lots of large glass windows, allowing for great views and tons of light. (I didn't see it, but there's also a patio area overlooking the water.) The cuisine is inspired by Italy and the Mediterranean and features specialty pastas, fresh seafood, and a wood-burning grill. Alma Nove offers pitchers of some of their cocktails (I've been noticing this more and more at restaurants and am hoping it's a trend that's going to stick around), so my mom, Liz, and I shared one. The pitcher gave us one drink each with a little to spare. We tried the Cape Stoddard, which is a mixture of Double Cross Vodka, St-Germain, and Spindrift sparkling cranberry raspberry soda. For appetizers we opted to share the Mediterranean chop salad and the beef carpaccio. The salad was full of tomatoes, cucumbers, kalamata olives, sweet onions, red peppers, feta, preserved lemon, and olive oil. The veggies were crisp and crunchy, and I loved how the feta coated every bit of the salad. The wagyu beef carpaccio was very thinly sliced and topped with hearts of palm, a little arugula, and some fabulous fried capers. I kept scooping extra capers up with my beef. I was all over the place trying to decide on an entree, but I finally chose the mafaldi with Italian sausage, roasted eggplant, fresh mozzarella, and tomato basil sauce. Mafaldi is one of my favorite pasta shapes -- it's like a skinny lasagna noodle with curly edges. I was so happy with my lunch choice. The sweet tomato sauce paired perfectly with the eggplant and sausage, and the melted mozzarella pulled the whole dish together. My mom also chose a pasta dish. Hers was a creamy carbonara-style dish made with basil linguine topped with sautéed lobster, sweet peas, and pancetta. The basil linguine was mildly flavored and not overwhelming. My sister and Liz both got the wood-grilled sirloin burgers with homemade pickles and fries. None of us had room for dessert, but my mom did try a Strawberry Basil Martini -- made with Hendrick's Gin, muddled strawberry, and basil. I found the drink a bit too strong for my tastes, but I thought the presentation was beautiful. Lunch at Alma Nove was a great way to end our girls' day out. Even though I didn't find my dress that day, we still had a great visit and some fabulous food. Have you been to Alma Nove yet? About a month ago, I went to Portsmouth, New Hampshire, with my friend Carrie to shop for wedding dresses. Her wedding is the month before mine, and we thought it would be fun to make the trip together and see if we found any dresses we liked enough to bring our moms back to see. Why were we heading to Portsmouth when there are plenty of dress shops right in Boston? There's a shop in Portsmouth called Madeleine's Daughter where friends and friends of friends have bought their dresses and it was recommended to me so many times I had to check it out. I'd rather go somewhere where someone has had a great experience than draw straws trying to figure out where to go. So anyways, that's why Carrie and I made the trek (it's only about an hour), and being the good brides we are, we headed out early to make sure we'd get to our appointments on time. We arrived with plenty of time to spare, drove into downtown Portsmouth, parked in the (ridiculously cheap to this Boston-area girl) parking garage ($0.75 an hour), and sought a place to have breakfast. We walked across the street to Popovers, which was also recommended to me by several friends. It just so happened that there was an open table outside, so the hostess reserved it for us, and we went in to place our orders. For some reason, we were both in the mood for egg sandwiches with cheese and bacon (maybe something about wedding dress shopping makes you crave bacon? ), so we each got one. The sandwich, served on a soft roll with lots of egg and gooey cheese, definitely hit the spot, but I wished a couple pieces of the bacon were a little crispier. I also wished I had room after breakfast for some of the delicious-looking pastries in the case. But, calories consumed and minutes dwindled, it was time to drive the 2 miles back down the road to the dress shop. We were both a little alarmed to see that the shop was in a strip mall, but our fears subsided once we got inside. We were greeted, checked in, and ushered to plush chairs to wait. Then we were each taken to our respective dressing rooms, where we tried on as many dresses as we could during our 1 hour appointments. My consultant helped me quickly narrow down what I was looking for. I went in with an idea of what I wanted and didn't want and actually loved one of the silhouettes I thought I would hate (trumpet) and hated the one I thought I would love (A-line). At the end, Carrie and I showed each other our top three dresses. I actually found my dress that day; I just didn't know it yet. I know everyone says you just know when you find the dress, but I am a little on the practical side, so I think deep down I knew I had found the dress, but I needed to look a little more just to be sure. I asked my consultant (McKenzie -- who I very, very highly recommend -- she was awesome) to mark down my four favorite dresses and planned to bring my mom back to see them. Wedding dress shopping is hard work. There's a lot of diving and turning, stepping up and stepping down, and gawking and admiring. We were tired and in need of some nourishment... and cocktails. A quick drive brought us back into downtown Portsmouth, and after a little wandering around, we decided to check out Surf for a light lunch. Surf, located on Bow Street, happens to have a teeny tiny back balcony with four tables on it that overlooks the water. It was a pretty warm day and I think people were trying to stay in the air conditioning, so we got the balcony all to ourselves. We started with cocktails. You all know my love for St-Germain by now and my desire to get everyone to love St-Germain, so we both tried the Piscataqua cocktail (St-Germain, Pama liqueur, Champagne, and soda water). The drink was just what we needed: a little bubbly, a little sweet, a lot refreshing. Then we decided to just share an appetizer and a salad. We went with the fried Jonah crab cakes and the fried tomato and crispy bacon salad (I'm telling you... wedding dress shopping does that!). The crab cakes were just the way I like 'em: lots of crab, no fillers. They had a crunchy coating and came topped with a Louisiana-style remoulade. I wouldn't recommend ordering the fried tomato and crispy bacon salad if you're really looking for a light salad, but if you want a salad with some depth and a lot of flavor, then go for it! The bacon on this salad was crisped to perfection. I don't think I've ever had fried red tomatoes, and I found them less sturdy and more "melty" than green tomatoes. This was an interesting way to add them to a salad as opposed to just chopping them and tossing them in. The tomatoes and bacon rested on a bed of mixed lettuces, and the whole thing was topped with a peppery parmesan dressing. Just as we were paying our bill, some other diners decided to brave the heat. The timing worked out nicely for us. And I just have to note that even though we were all alone on the balcony, our waitress was awesome. She was attentive, never forgot about us, and made some great recommendations for us about the drinks we got and the dishes we ordered. It was so relaxing and peaceful to sit out on the water, sip cocktails, have some girl time, and enjoy a leisurely lunch. Overall, we had a really fun day in Portsmouth. I think trying on dresses made the wedding seem even more real and imminent. One of the things about having a long engagement is feeling like the wedding is lightyears away and there's plenty of time to get everything done. But that gets balanced out by realizing there's more and more stuff to do and then thinking you won't ever get it all done. It was kind of a relief to start the dress shopping process and realize that there actually could be a dress out there for me. I left looking forward to returning and showing off the dresses to my mom... and hopefully spending a little more time in downtown Portsmouth. Have you been wedding dress shopping -- for yourself or friends? What do you remember most about it? This pasta dish was inspired by a recipe for pappardelle and corn in Food Network Magazine and completely came together as I wandered around Wilson Farm, picking up veggies that called out to me. While I was planning to make this with pappardelle, I changed my mind when I found fresh summer squash and basil linguine at the farm stand. I couldn't imagine a better pasta pairing for the veggies I had picked out. The days of perfect summer tomatoes and sweet corn are dwindling, so I recommend making this as soon as you can to savor the flavors of the season. Melt 3 tablespoons butter in large skillet over medium heat. Add tomatoes and zucchini, and season with salt and pepper. Cook for 4 to 5 minutes, or until tomatoes soften. Add garlic and green beans, and cook for 2 minutes. Stir in the wine and corn, and cook for 2 minutes, or until wine is reduced by half. Meanwhile, cook the pasta in the boiling water according to package directions. Drain, reserving 1 cup pasta water. Add the chicken broth to the skillet, and then stir in the pasta once it's ready. Season with salt and pepper, and serve with basil. I can't get over how good this turned out. I mean I guess it makes sense. I used tons of fresh, local produce. I only used veggies I loved. And I used fresh pasta. I even bought a basil plant and clipped fresh basil just before garnishing the dish. Everything about this dish was so fresh! It has bright, clean, sweet flavors running through it. What are your favorite summer veggies to throw in pasta? One of my friends started working not far from where I live, and she and I have since been trying to hit up some Cambridge spots together. A couple weeks ago we met up for $2 grilled cheese and other appetizers at Dante, and Bambara was next on our list. We had planned to meet at lunchtime, but one thing led to another and we found ourselves making reservations to have dinner there with significant others and friends last Friday night during Boston Restaurant Week. We gathered around our table for seven near the entrance to the restaurant and started off by ordering drinks. I thought it would be super economical if my friend and I split a half carafe of prosecco for $12 instead of each ordering a glass for $10. The half carafe was just a small bottle, not quite what I expected, but it was enough for two glasses and ended up being a good start to the meal. For my appetizer, I decided to try the Boston feta salad. I feel like I've been on a feta kick all summer -- and I'm definitely not ready to get off it. The salad is made with Boston lettuce, feta, English cucumbers, roasted sweet and hot peppers, kalamata olives, cherry tomatoes, toasted pita bread, and lemon vinaigrette. As I was typing up this description, I realized that I don't think there was any toasted pita bread in my salad. There were some crusty rolls and butter on our table, so I guess I didn't miss the pita much. Other than that, the salad was delicious and filled with so many different flavors. I was a little nervous about the hot peppers, but there were only a few of them and they added a subtle heat when mixed with the other components. For his appetizer Jeff tried the arancini, which are crispy risotto balls with short-rib meat, Parmesan, Fontina, herbs, and tomato and aioli sauces. The risotto balls were definitely nice and crispy. I snitched a tiny bite. Jeff really enjoyed these. I ate some of the extra sauce he left on his plate with a little leftover short rib. The short rib was so tender, and I thought the tomato sauce was rich and flavorful. Moving onto entrees, Jeff went with the grilled filet of beef in a red wine sauce with ratatouille and roasted new potatoes. If you know anything about Jeff, you know he'd never eat ratatouille. Bonus for me. The ratatouille was full of the usual tomatoes, zucchini, and eggplant, cooked until soft and well flavored. I also tried a little piece of his filet and thought the red wine sauce took the meat dish up a notch. For my entree, even though I had just had pork at L'Espalier that afternoon, I went with the grilled pork medallions. These were served with creamed local sweet corn, smoked tomato broth, and crispy onions. It was the accompaniments that truly convinced me to order this dish. The pork was moist and well seasoned and topped with roasted tomatoes. The smoked tomato broth and corn were so good, adding extra levels of flavor, and paired perfectly with the pork. It was one of those ultimate summer dishes. And who doesn't love crispy onions? There weren't any desserts that really called out to me (and I was stuffed so maybe that's why), so I went with the peach shortcake, which I thought would be on the lighter side. Triangles of angel food cake drizzled with caramel accompanied roasted peaches and whipped cream. The dessert was delicious, but I barely made it through half of it. Jeff tried the hot chocolate cake with creme anglaise and raspberry coulis. The cake was very rich, and he didn't make it too far through dessert either. I didn't want to bug everyone at the table taking pictures of their meals, but as far as other entrees, some people tried the scallops (I heard there were only two, which seemed a little skimpy, but they were good), and someone got the steak frites -- I saw a generous serving of fries. Other appetizers that were ordered included the tuna tartare, the lobster bisque, and the chopped salad. Everyone was happy with their choices, and we all enjoyed the atmosphere. Our server was friendly, pleasant, and attentive (until the end... it took a long time for him to come back and get our credit cards) and helped us select dishes from the menu, offering suggestions of his favorites. This was another winning Boston Restaurant Week experience. I loved Bambara's restaurant week menu because it consisted of dishes the restaurant normally serves. This is the way to do restaurant week, if you ask me. I hate when restaurants do something different. That doesn't give me a sense of what you do and doesn't make me want to return and pay full price. I think of restaurant week as a trial for a particular restaurant. Bambara passed with flying colors. And the best news is that the restaurant week menu is available the whole month of August, so you still have time to go check it out. Have you ever been to Bambara? Last Friday Meghan and I both had the afternoon free, and we decided to meet in Copley to check out the farmers' market and grab a bite to eat. While we had intended to just grab sandwiches or something at the market, on a whim, we changed our minds and wandered down Boylston Street trying to decide where to have lunch. Sel de la Terre was nearing the top of the list when we spied L'Espalier. Normally, we wouldn't pop into L'Espalier on a casual Friday afternoon (I'm never in that area at that time... and believe me, I was in shorts and a t-shirt), but I remembered it was Boston Restaurant Week. L'Espalier only does a restaurant week lunch special, so we kind of figured this might be our only chance to stop in not only for lunch, but lunch at a bargain. We went in and quickly learned from the hostess that there were available seats, and she ushered us into the elevator. When we got up to the restaurant level, we were greeted by another host, and he started to lead us to our table. All of a sudden I noticed a large table in the center of the restaurant and a couple of familiar faces -- Jeff's mother and some of her friends were dining at L'Espalier as well. We stopped to say hi, while the host patiently waited, and then we proceeded to our table. I texted Jeff and asked him to guess whom I saw at lunch. His answer: Chad Ochocinco? He was just a little off! Meghan and I settled in at our table, glanced over the menu, and decided to do wine pairings with our lunch. A three-course lunch was being offered for $20.11, and the wine pairings were an additional $14. Our waitress suggested we start with a little bubbly for our first pairing, and we were both happy to oblige. 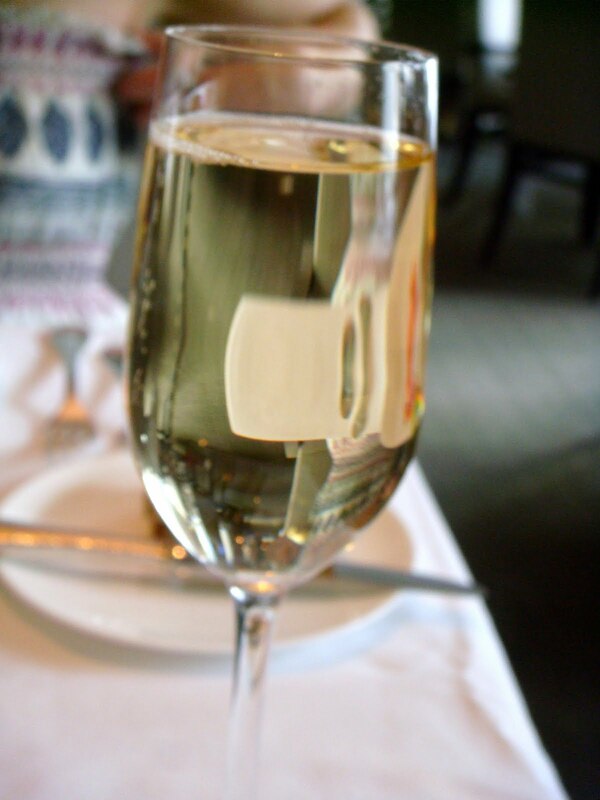 She poured us each a glass of the Louis Bouillet, Brut, Cremant de Bourgogne. After we had a few sips of bubbly, our first courses arrived. We both opted for the Apple Street Farm heirloom tomato salad with chevre panna cotta and balsamic. I loved the presentation of this salad with teeny tiny tomatoes in little puddles of balsamic. I thought it was a little strange that the heirloom tomatoes were peeled, but it was definitely easier to cut and eat them without the skin and made for a nice presentation. The panna cotta was light and smooth and paired so well with the tomatoes. I typically find frisee too bitter, but it was dressed just right and not sharp at all. For my entree, I chose the roast pork loin with sweet corn pudding and red pepper puree and moved onto a glass of the 2010 Rimbert, Syrah/Carignan, St-Chinian. The pork was cooked perfectly! It was thinly sliced and very moist. The gravy on it was so flavorful, and the red pepper puree pulled all the flavors together. The sweet corn pudding was better than I expected. I was afraid it would be like bread pudding, but it was more like a very, very moist corn muffin topped with sweet, creamy corn. It was incredibly filling, and I had to leave a few bites behind. Meghan got the seared salmon with ratatouille and creamy polenta, and you'll have to read her review to see what she thought. We did what any smart lunch companions would do and each ordered one of the desserts so we could share them both. The first dessert was a wild strawberry-vanilla mousse with lychee foam and raspberry-balsamic vinaigrette. I'm still not sure how I feel about foam, but it did add another dimension of flavor to the airy mousse. The second was a sachertorte. As you can tell from the photo, this was not your typical sachertorte. It came with mango fluid gel, amaretto chantilly cream, and cookie crumbs. The chocolate cake was light and moist, and the gel and fruit puree were sweet pairings. I had an absolutely lovely time lunching at L'Espalier with Meghan. This was my third visit to L'Espalier, and I once again left looking forward to going back. The service and food both make the experience worthwhile, and I'm happy that L'Espalier holds itself to the same standards during Boston Restaurant Week as the other times I've been there. If you had a Friday afternoon off, where would you go to lunch?